I finally finished the curtains for Eliza’s room! I’m a novice sewer, so these took me forever. They contain both my first attempt at hemming and my first attempt at ruffles. 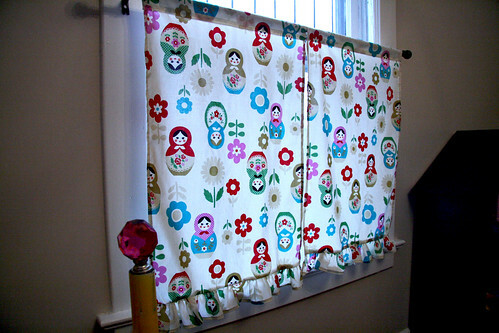 It took awhile for us to decide what kind of window treatments to use in Eliza’s room. The 100 year old leaded windows leak very badly (air, not water), so we use Indoor Window Insulation Kits. That means blinds are out. We also didn’t really want to cover up the pretty leaded glass. Cafe curtains were the prefect fix. She’s on the second floor, so just covering the bottom half of the windows wasn’t a problem. I love that there is still plenty of natural light in her room. 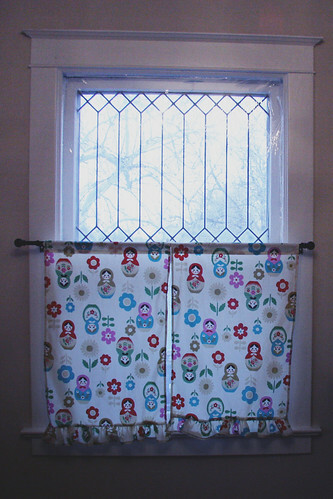 The design came from One Yard Wonders by Rebecca Yaker and Patricia Hoskins. It feels great to actually complete a project from a craft book! It was simple once I got going, though I did have to call my mom about 7 times the first time through with the hem and the ruffle. The book didn’t explain the ruffle making process very well. You have to top stitch using the longest stitch setting on your machine, leaving long tails of string on both ends. When you pull the string, the fabric gathers. But I kept breaking the string. This is because you have to bunch up just a little bit of fabric and then spread out the bunches along the length of the fabric. I can make a video tutorial on how to make ruffles if anyone is interested. I’m pretty much hooked. I’m going to make a manly version of these for Nick’s room next. I have big plans for the rest of the fabric. It’s Japanese import, so it’s a little pricey, but I might just have to go back and buy the rest of the bolt. I love nesting dolls. My great-grandparents had a set and I’d always go for them first when playing at their house. My grandma would call us her little babooshkas. Which doesn’t make too much sense, because the word is Russian for grandmother. 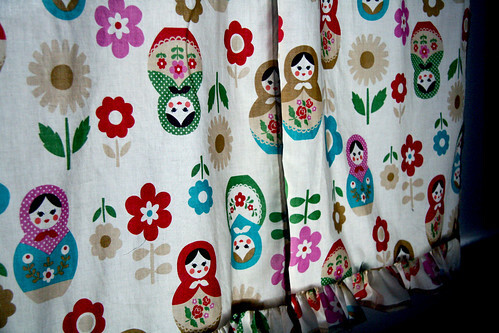 But Russian nesting dolls are also sometimes called babooshkas, so they are nostalgic for me. I’ve been looking out for a great traditional looking vintage set, but haven’t had any luck yet. E has a Christmas Santa set that she loves, so she’s excited to find a Russian version as well. What projects have you completed lately? These are so cute! I love them! I would love a ruffles tutorial video, if your willing to do it. I want to do this for Ben and Syd's room.